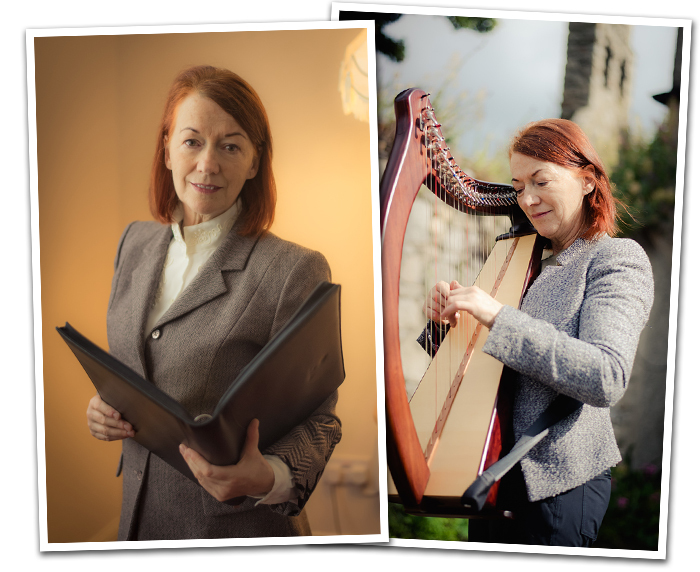 Trained as a Celtic harpist in Ireland, Madeleine won a scholarship to study classical music in the US where she studied classical harp. As a solo artist she has toured Europe, the US and the Caribbean and has recorded for radio and television both in Europe and America. Madeleine plays both Celtic and pedal harp. Her Little Big Blue concert harp was made by Camac, the French harp manufacturers. 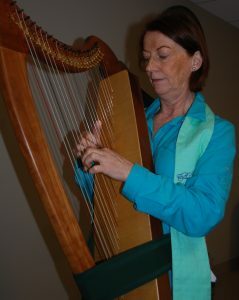 For her healing work, Madeleine studied harp therapy. Her training included playing over 100 hours by the bedside in a general hospital in the USA. She plays a specially designed 23 string therapy harp that makes it possible to walk and play, so that the gentle ambiance of the therapy harp can be heard wherever it is needed. The harp size allows her to play by the bedside in care homes and hospices, generating a soothing cradle of sound. Some years ago, Madeleine also trained as a secular celebrant, so that she could offer unique bespoke ceremonies for weddings, naming ceremonies and funerals. She is an accredited member of a professional organisation, committed to ongoing supervision and professional development in her celebrancy work. Madeleine writes music and collaborates with other musicians, recording both in Ireland and abroad. Her specialty is harp improvisations. Projects she has worked on include film scores for India’s most exciting groundbreaking composer A R Rahman (whose music for the film Slumdog Millionaire won an Oscar). She has also worked with Jimmy MacCarthy whose songwriting hits include Mystic Lipstick, Ride On, No Frontiers and The Contender.